I’ll show you the exact strategies that allowed my one of my clients to explode their earnings from a respectable $60,000 a month to a whopping $150,000 a month. This was more than double what they thought was possible and it was achieved without them working any more hours. I understand and respect this, and the great news is…. Every practice has the potential to bring in at least an extra $100,000 per year. You just need to tap into it. This is why I work one-to-one with you – so we can dive deep into your unique circumstances and tailor the strategies perfectly for your practice. So don’t. Don’t. Give. Up. Not ever!! Dentistry is a “people business” and in my presentations I share the inside scoop on the unique systems my practice (and those of my clients) have utilized for outstanding growth. 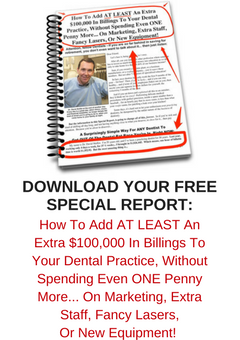 I share my best strategies (for a successful dental practice) learned from my own success as well as studying philosophies of the most successful companies outside of dentistry. Unique Hidden Systems/Protocols That Are Effective, Different And ‘Not The Norm’ To Produce Exceptional Outcomes.